I know I sound like a broken record, but this winter is relentless. It just keeps getting colder and more brutal out there, making the need for adequate and effective skincare stronger and stronger. Combining the weather with the fact that I sit at work with a space heater on me makes for parched and uncomfortable skin. I have been running through body products like crazy this season (I just finished this lotion from Fresh and this oil from REN which smells amazing), so I have been testing these two products out of sheer necessity, which turned into sheer enjoyment, which turned into "I have to write about these products!" That's pretty much my process. So scientific, right? 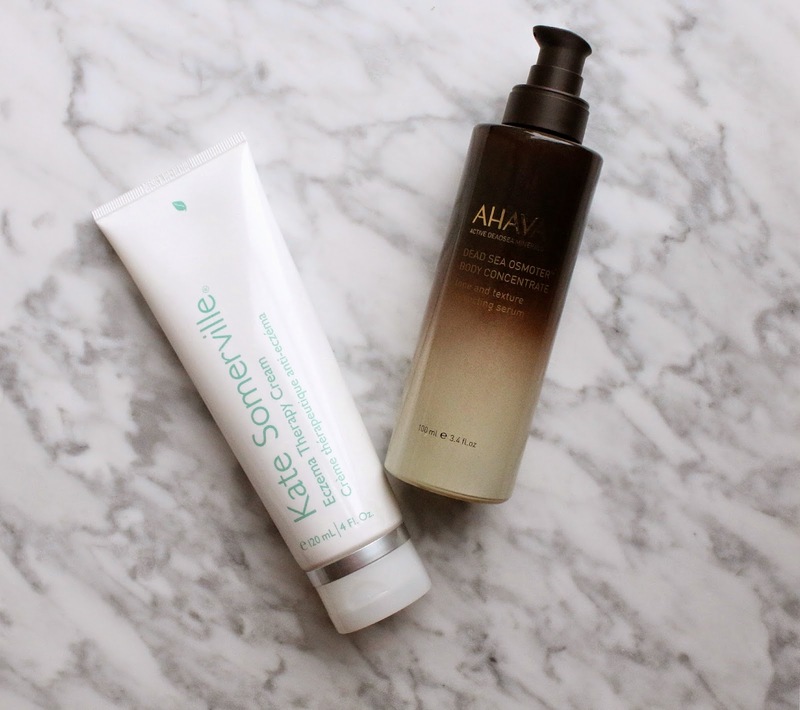 I have been using both of these together and layering them for the most intense hydration I can get, and let me tell you - my skin is thanking me tenfold. 1.Kate Somerville Eczema Therapy Cream - I think the main difference between my body skincare needs in the winter versus the rest of the year is the amount of soothing and comfort the products can give to me. Dry skin can be a hassle but when it hurts or gets extremely sensitive because of such severe weather conditions, a different kind of product is needed. I do not have eczema but I felt that this cream would be the ultimate in nourishment for my skin - and it was. This cream is rich - R-I-C-H but surprisingly not in a overpowering way but more in a cocooning and comforting way that makes you feel good in your own skin again. There is no scent to this which is nice for a change, and is so powerful that I can moisturize one day, skip a day or two and still feel hydrated. This gets the award for winter MVP. 2. 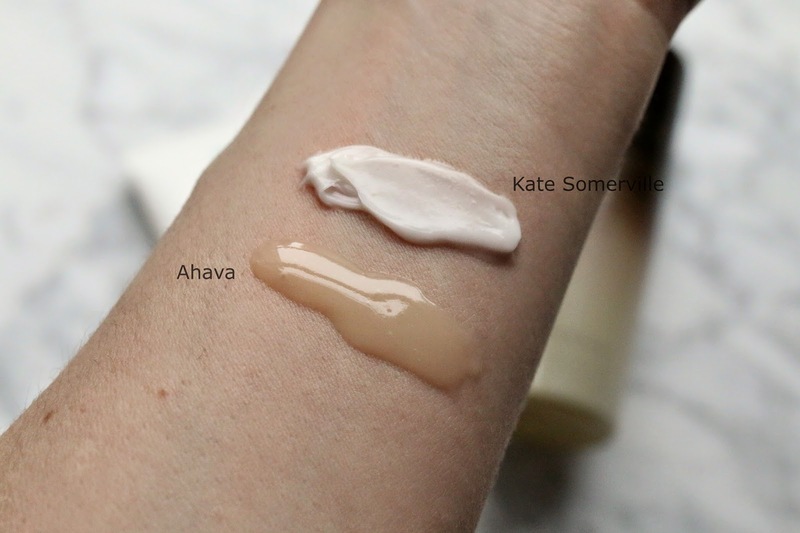 Ahava Dead Sea Osmoter Body Concentrate - This is the first Ahava product I have tried so I was not quite sure what to expect, and tried it out of sheer necessity for something hydrating after a particularly cold day. The texture is much like a serum, and that is how I use it. I wear it under the Kate Somerville Eczema Therapy Cream to give me that added boost and find that the two pair very well together. In addition to the hydration factor, the Body Concentrate helps improve tone and texture. I had a burn mark on my stomach from a silly clothes-steaming accident and it's stubbornly remained there for the past few months. As soon as I began using the concentrate, I slowly began to see it fade more and more until it is hardly noticeable now. The texture of my skin feels better and my regular stubborn dry patches (elbows and knees) are smoother. These two combined together have become my winter secret weapon (though secretly I hope the weather just gets better which is delusional and crazy, I know). Oh my gosh!! I have gift cards at home - I will be buying these two products tomorrow!! For some reason, this winter is really affecting my skin so I need something to really get it moisturized. Thanks for posting!! !